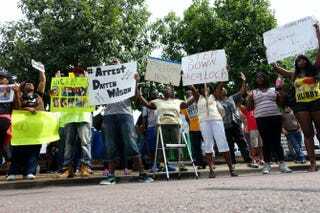 Protesters rally outside the office of St Louis County Prosecuting Attorney Robert McCulloch on Aug. 20, 2014, demanding the arrest of Darren Wilson, the white police officer who shot and killed African-American teenager Michael Brown in the St. Louis suburb of Ferguson on Aug. 9. As a nation marched against police violence in the black community, the Associated Press reports that the St. Louis prosecutor on Saturday quietly released additional documents from the investigation into the police shooting death of Michael Brown, including an interview transcript of a friend who reported seeing the teen get shot in the back. St. Louis County Prosecuting Attorney Robert McCulloch said the newly released records were inadvertently excluded from the thousands of pages of other documents made public Nov. 24, when a grand jury decided not to charge white Ferguson, Mo., police Officer Darren Wilson for killing Brown, a black 18-year-old, AP writes. The documents include a transcript of an interview of Brown's friend Dorian Johnson conducted by the FBI and county police just four days after the Aug. 9 confrontation in which Wilson shot the unarmed Brown, touching off a national debate about race relations in America, the report says. Earlier documents show that Brown was not shot in the back but was struck by bullets in the head, chest and arm. Johnson's account to investigators was generally similar to his later grand jury testimony, in which he portrayed Wilson as the aggressor during a struggle that began at the officer's vehicle and led to a brief chase before Brown's fatal shooting, the report says. The case is just one of many reasons tens of thousands attended Justice for All rallies around the country Saturday to call for an end to police violence and demanded changes to state grand jury proceedings. Read The Root’s rally coverage here.